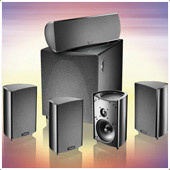 Custom Theater and Audio carries a wide variety of high-performance speakers in different styles and designs capable of meeting your décor, budget and performance needs. Architectural in-wall and in-ceiling speakers are terrific options for distributed audio systems, with many new speaker designs featuring micro-thin bezels that virtually disappear when installed in a room while still providing terrific audio. Bookshelf models work well in living rooms or studies and can be placed inside cabinetry. On-wall designs match the aesthetic of wall mounted, flat-panel displays and work perfect in bedrooms or with TVs mounted over a fireplace. And floorstanding towers provide the ultimate in performance, perfect for media and theater rooms or areas where critical listening is key. 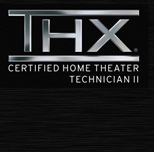 Whatever your needs, Custom Theater and Audio will help you choose the right speaker for your system! Select from such prestigious manufacturers as Definitive Technology, Monitor Audio, Triad, Niles, Episode, and Sonance. 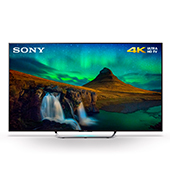 There are a lot of complicated decisions to make when it comes to choosing a new television – screen size, LED, OLED, Ultra HD, HDR, Dolby Vision, Smart TV, 4K… All of it can be overwhelming! But Custom Theater and Audio has the expertise to go over each option and ensure the set you select is the right one for you and your viewing environment! We can also help you choose the ideal screen size for your room, and determine the best way to install your new TV. As experts in wall-mounting TVs, we are happy to install your new or existing TVs on the wall for a sleek, modern look without any visible wires using a variety of mount styles to fit any application! Custom Theater and Audio is a certified Sony Diamond Dealer, with multiple sets on display in our showroom. We also carry flagship UltraHD models from Samsung and OLED from LG. Some applications require a TV or installation that’s out of the ordinary. Say you want to catch the news or weather while getting ready in the bathroom, but don’t want to have a screen sitting on the counter or mounted to the wall. Seura manufacturers specialty models in a variety of sizes that are concealed behind mirrors for completely discreet look when not in use. 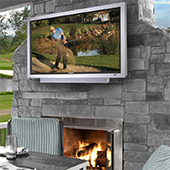 Or if you want to enjoy TV outside on your patio, veranda, or out by the pool, SunBrite offers true outdoor TVs in a variety of sizes rated for use in all weather conditions. These sets are truly turn-a-hose-on-them weather resistant, designed to withstand the high humidity and salt air of beach living. And if you’d rather not see a TV on the wall, you can conceal your screen behind a VisionArt system which hides your screen behind artwork and a high-quality frame, automatically rolling the artwork up inside the frame to reveal the screen when it’s time to watch. Creating a truly cinematic experience at home requires a big screen; with bigger-than-life images that draw you into the action. And nothing delivers the big screen experience like a video projector! With a projector you can enjoy images 120-inches or larger in size, bringing the excitement of the movie experience right into your home! A projector also makes your house “the place to be” for big events like the Super Bowl or World Series parties, enabling everyone to easily see the action on screen. Gamers also love the ability to immerse themselves in a giant screen, seeing more of the action than ever before! Modern projectors are smaller, brighter, less expensive, and more reliable than models in the past, meaning they work in more rooms than just dark, dedicated theater rooms. Further, projectors typically mount to the ceiling, freeing up precious wall space. 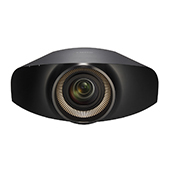 Custom Theater and Audio proudly sells UltraHD, 4K projectors from Sony, Epson, and JVC. 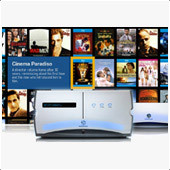 We invite you to come see a Sony 4K projector and 100-inch video screen on display in our showroom’s dedicated theater. A screen is the perfect complement for a video projector, and Custom Theater and Audio will help you to select the perfect screen size and material for your new home theater! Different screen materials are available depending on your viewing room; some perfect for rooms that can be totally dark, others for rooms that have a lot of ambient lighting. Selecting the perfect gain ensures you get the brightest image for your space without sacrificing detail or viewing angle. Fixed screens that mount on the wall like a large picture are perfect for dedicated rooms, while motorized screens that lower when needed, but disappear when not, are perfect for multi-use rooms like living rooms. Custom Theater and Audio proudly sells Draper, Elite, Stewart and Screen Innovations screens that come in a huge array of sizes and styles perfect for any system! Do you have a coffee table littered with different remotes controls, always fumbling trying to figure out how to get the TV turned on? A tableful of remotes is not only ugly, it’s confusing! If your system is too complicated for everyone in your home to use, it won’t be enjoyable. 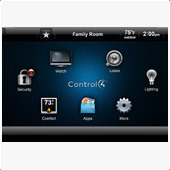 Your family will thank you when your system can be controlled by a single remote with a “Watch TV” button that handles everything for you! Your home will likely have many “sub-systems”; lighting, HVAC, security, and audio/video systems. These may be from different brands, different manufacturers, and have control systems of their own, but what ties them together and makes a harmonious, easy-to-use experience is a single control system capable of handling everything. Whether you just want to replace the five remotes it takes to operate your TV system or want to control every aspect of your home from your iPhone or iPad from anywhere in the world, Custom Theater and Audio has the perfect system for you! We proudly feature Control4, URC (Universal Remote Control), and Logitech-Harmony systems to ensure the perfect controller for every job and budget! It takes several components to make a home theater system work correctly and successfully, and Custom Theater and Audio carries the best brands to deliver an amazing experience regardless of your budget! 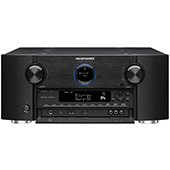 A receiver is likely the centerpiece of your system, and Custom Theater and Audio proudly sells Denon, Yamaha, Marantz, and Sony models featuring the latest HDMI and 4K HDR switching, advanced room correction to ensure the best sound in your room, and the latest surround sound processing! Whether you want a basic 5.1-channel system, or state of the art 7.2.6 Dolby Atmos theater, we have a system to handle the job. Custom Theater and Audio will walk you through the process, making sure you understand all of the options and that you end up with the components that are right for you and your system. It takes deep, thundering, awesome bass to capture your attention and really wow your guests with an amazing movie experience! And that means having at least one subwoofer. A high-performance subwoofer makes any system sound bigger and fuller. Subwoofers relay the drama in movies; things like dinosaur’s foot stomps, shotgun blasts, explosions, and car crashes. Basically, all of the exciting parts of the movie are far more impressive with a great sub! Adding additional subwoofers creates smoother, more even bass performance throughout your room, ensuring every listener enjoys the same dynamic experience. 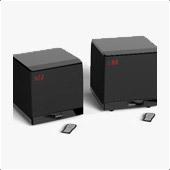 Modern subs can deliver great bass from small packages, some measuring less than a foot in any direction! This allows them to be concealed in a room, delivering terrific sound while blending in with your décor. Other subwoofers can be installed in a wall or ceiling, taking up no floorspace in your room at all! Custom Theater and Audio sells subwoofers from Definitive Technology, Monitor Audio, Triad, and SVS. Modern, TVs have ultra-thin, bezel-less designs that look beautiful and produce great pictures, but this design aesthetic comes at the expense of their ability to produce decent audio. In fact, most modern TV designs feature tiny speakers that fire away from the listener, either into the floor or the wall. The result is thin, difficult to understand audio, that often leaves you wondering, “What did they say?” For areas where a full surround speaker system isn’t practical – such as a bedroom or study – a soundbar can be the perfect solution! A soundbar is an all-in-one speaker that sits on a shelf or mounts on the wall below the TV and provides far better sound than the TV speakers alone produce. 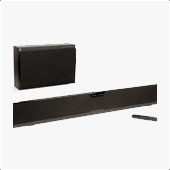 Higher-end soundbars come with wireless subwoofers for deep bass and full, rich sound, and many models offer the ability to add wireless rear speakers to create a true surround sound experience. They also include some powerful music streaming features, letting you stream your favorite music directly to the bar. Custom Theater and Audio sells a variety of quality soundbars from Definitive Technology, Sonos, Sony, and Yamaha covering a range of budgets and performance needs. We have several models on display in our showroom allowing you to experience a soundbar in action! Playing physical media – Blu-ray, DVD discs or CDs – is quickly becoming a thing of the past…the future is streaming digital music and video files! A media server can house thousands of albums and movies on hard drives and then stream them around your home, enabling you to easily enjoy your content in any room! With metadata like album art, and artist, album and song info automatically catalogued, you can easily browse your library and make smart choices from a smart phone or tablet! 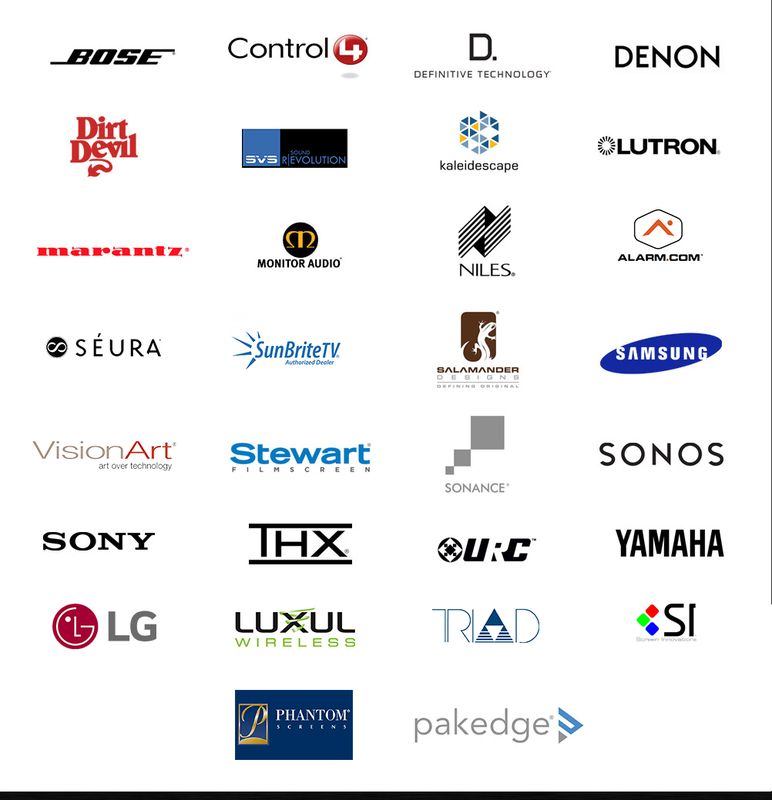 Custom Theater and Audio loves the Sonos music system which supports not only your own music library but also a huge array of cloud-based content like Pandora, Sirius/XM, Spotify, Tidal and many more. For movie lovers, the Kaleidescape Strato movie server supports fully uncompressed UltraHD 4K movie playback, allowing you to have an amazing movie watching experience! No more lost or scratched discs, no more hunting for your favorite title, no more waiting for discs to load! We have both systems on display in our showroom, and would be happy to demonstrate and explain their operation! You hear a strange noise in the middle of the night. Your wife and children are at home alone. You are leaving your house unoccupied for the winter. A security system is about peace of mind, knowing that your home is being monitored and looked-after even when you can’t be there. Our security systems integrate with Alarm.com for the added security of cellular back-up of your monitoring, as well as the convenience of being able to quickly arm/disarm the system from your mobile phone! Monitored smoke/heat and CO sensors can also help to keep your family and home safe, and leak detectors can notify you of a small problem before it becomes a catastrophe. Beyond protecting your doors, windows, and interior with motion detectors, adding a video camera surveillance system and Digital Video Recorder (DVR) allows you to check in on your house remotely via the Internet and see exactly what is happening. 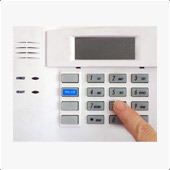 Get notified when someone approaches your front door and see and talk to them via your mobile phone. Custom Theater and Audio installs smart security systems from a variety of top manufacturers that can integrate with Control4 automation systems for complete control. We also offer smart door locks in a variety of designs and finishes that can email you to let you know when someone comes or leaves your home.